Trailhead of the Fimmvörðuháls route. Fimmvörðuháls is a 14 miles long route over the Fimmvörðuháls Pass between the Eyjafjallajökull and Mýrdalsjökull ice caps, then down the other side to Skogar. 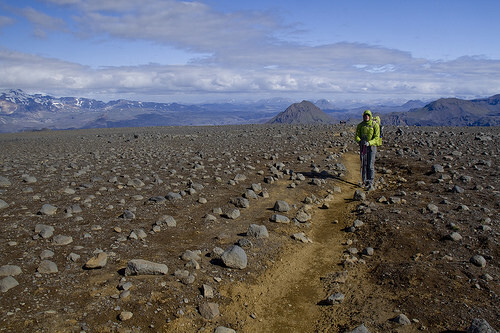 For many it is a natural extension of the Laugavegur Trail; however the route that climbs over 3000 feet over a rough mountainous terrain should not be taken lightly. Weather, for instance, is a constant consideration. 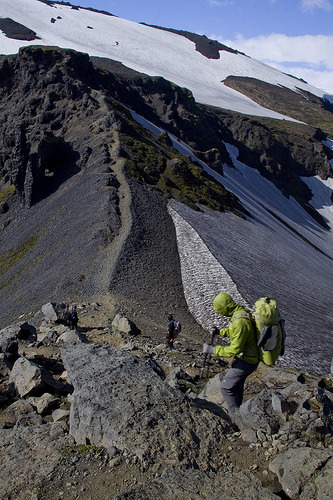 The pass is known for being scoured by high winds and snow often lingers long into the summer. Today the weather is perfect. The sun is out, and there is only light wind expected over the pass we are told by the warden at ITA hut when we ask about conditions. Just couple weeks ago the route was still impassable due to snow but by now plenty of hikers have successfully completed it. I’m stoked for the climb. 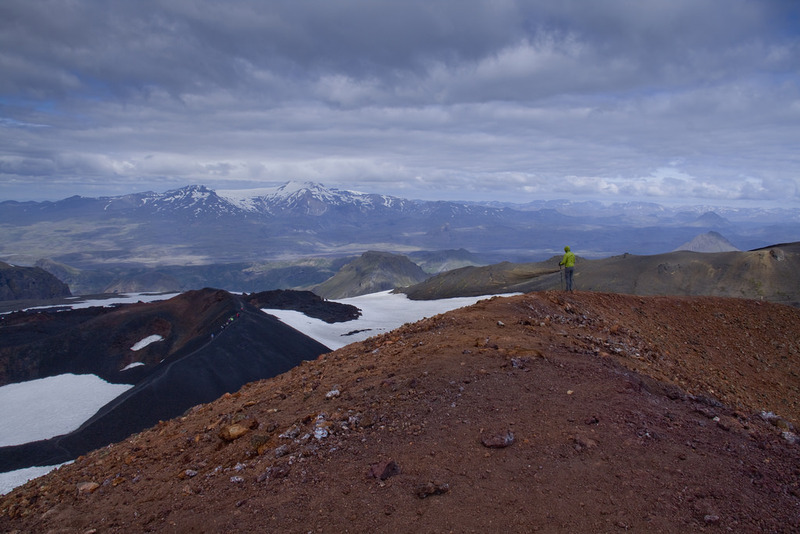 As much as I enjoyed strolling along the Laugavegur Trail, I am ready to get higher up and enjoy the views from that perspective. Before we get to the ascent we have to cross the river. Krossa runs down the valley split into several channels. The smaller ones are an easy rock hop. Bridges aid crossings where the river runs deeper and faster. They are unlike any bridges I have ever seen before. The whole construction sits on large rubber wheels, ready to be moved if the river changes its flow, or to be towed away should a danger of flood occur where a typical stationary bridge would be in a danger of being washed out. It’s pretty smart setup. For another mile or so the trail keeps us in the valley. We follow Krossa upstream until we reach camp Basar where we take a 90 degree turn towards the ridge. 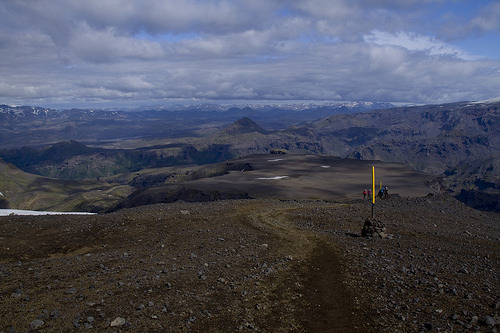 Due to its proximity to the trailhead Basar is a popular choice for those hiking to Skogar and if we were attempting the hike in a single day it would make sense to take advantage of the location. With 2 days to complete the trail however; I am happy with our choice to stay at the ITA hut which offered nicer sites and more amenities. 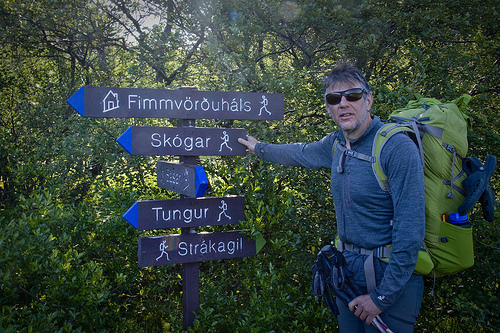 Trailhead for Fimmvörðuháls Trail is located just behind Basar. The trail shoots uphill and soon the views start opening in front of our eyes. First we get a nice close up view of a canyon nearby. It cuts deep into the mountain mass and its gorge reaches all the way to the valley. 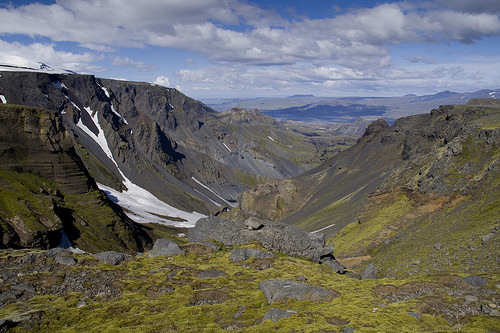 In the distance we can spot the buildings of Thorsmork. Nice views opened around us after the initial ascent. After climbing for several hundred feet we step onto a small plateau. About 5 tents are perched here. Their view ecompasses the valley bellow and mountain in all directions. It must had been spectacular here last night when the sky turned light pink during sunset. What goes against this site is the lack of water. The nearest water source is Krossa if coming from Thorsmork or random snow patches long way away if coming from the pass. The next stretch follows short ridge which is narrow with drop offs on each site. Chains are provided at spots where a slip could easily occur. The crux is at the very last part where we have to climb small cliff band, again with the assistance of a rope. Afterwards there is a stretch of relatively flat, open area. It’s a bare expanse of dark dirt through which track was beaten by travellers. The route is staked by poles with yellow markings. There is little need for them today but if visibility dropped they would lead us through this area in a safe distance from cliffs. The views are expanding. Glaciers are what we notice most. Enormous glaciers, dangerous and beautiful, stretching to the horizon. Soon we touch snow ourselves. 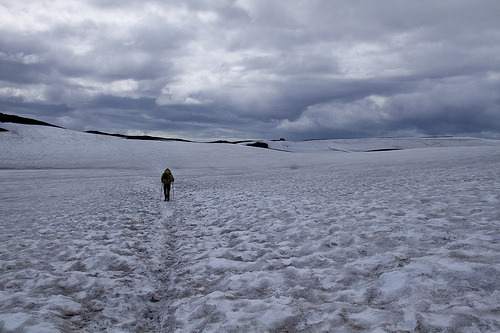 Just like many other places in the highlands, the path have not yet had a chance to completely melt and it is likely the snow will remain here for the rest of the season. It’s snow touched by the warmth of the sunny day, soft and slippery with a consistency similar to granulated sugar. The wind picks up. Weather here is unpredictable. The forecast promised a calm sunny day but there are suddenly clouds above our heads. They are not the cute puffy type harmlessly lingering in the sky, these clouds are dark and they race above our heads threatening to drench us. It’s not raining yet when we approach Magni and Modi, two new craters created during volcanic activity in 2010. 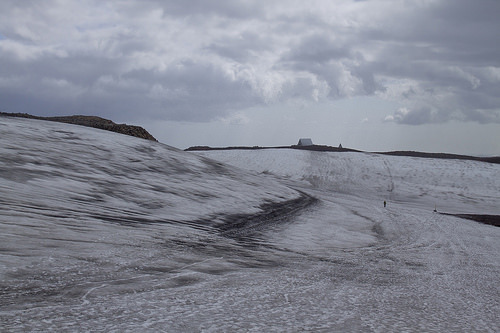 Vast lava field surrounds them but today only portion of it is melted out, dark island of rock in the sea of snow. There is an easy side trail that takes atop Magni. This exciting experience of climbing on the new rock makes us forget all about the deteriorating weather but the nature, unlike us, has foolproof memory. It sprays us with an unpleasant drizzle shortly after we descent. The rain is not strong but it’s persistent and even though my rain gear keeps the precip out, this part of our hike soon becomes cold and miserable. Dave descanting toward narrow ridge. There is no official marker to announce the pass. We take a quick photo at an intersection we determined is the highest point of the route. From here two huts can be reached. If we took 90 degree turn we would arrive at Baldvinsskáli in 0.4 miles. The hut seems larger than Ultivist which is directly on our route and from here its A frame is also visible in the distance. The weather is at its worst, my feet are soaked. 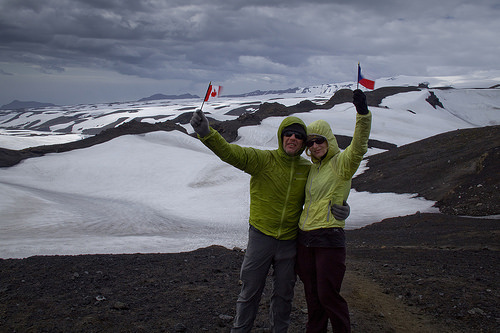 We don’t know much about Baldvinsskáli and I don’t feel up for wild exploration so we stay on our route. Later we find out that Baldvinsskáli is a hut meant to be used for emergencies only. There is no traditional accommodation offered there nor does it seem to have many amenities. At Ultivist we are offered cozy kitchen to warm up. We are told that if we wanted to use the kitchen for cooking, the fee is 500 kronas; however if we purchase couple of instant soups (also 500 kronas), we can use the kitchen for free. Fifteen minutes later we sip on the soups and contemplate what to do next. Our options are to camp here at the hut or push forward not knowing where or if there is a place to camp along the way. The weather is not improving, it’s still spitting and the clouds seems to be getting heavier and darker. Camping up here does not particularly tempt me but it would be safer than heading into the unknown. Atop Magni overlooking the scenery towards Modi crater. A group of young trekkers from Russia overhears our discussion. They are heading the opposite direction and last night they camped along the trail. They share the location of their site which they say was partially wind protected and had water source. Our decision is made. The problem is that when we arrive at the spot they described, there is no campsite in sight. After 15 minutes of fruitless search we decide to hike little bit further. We have now reached Skoga, river that we will follow for next 5 miles to Skogar. Skoga is probably the wildest river we have seen during our trek. For significant amount of time its flow is contained within walls of a narrow canyon through which is rumbles with incredible force. There is a bridge taking us across. On the other bank the trail skirts on an edge of a pasture where we notice a small sand pit. Few steps away is a larger one with a view of the river and one of its many waterfalls. It’s not the site we were told about but it’ll do. Tomorrow is the last day of our hike. We will say goodbye to the highlands and catch a bus back to Reykjavik. But there is still five more miles of beautiful Icelandic landscape between us and the comfortable bus seat. I’m curious what they will be like. Back on snow. Our feet got wet and cold here.